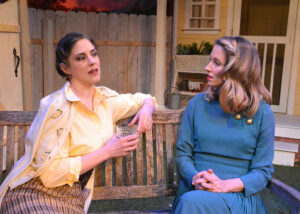 Francesca Casale and Mark Belnick in "All My Sons". Photo by Ed Krieger. 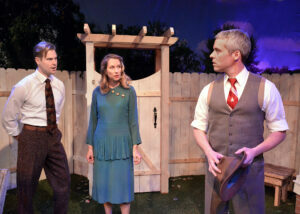 With a President in the White House whose ethics seem to be in question on an hourly, if not daily, basis and the tragic recent Boeing crashes taking the lives of hundreds of people for no clear reason other than one that saved the company money, it’s little wonder that Arthur Miller’s All My Sons might be of interest. Gary Lee Reed directs the Wasatch Theatrical Ventures presentation of the play at The Lounge Theatre in Hollywood, CA and as he states in his note in the program “the devastating impact of lies and denial are often never exposed… until it’s too late.” With the revelation of these lies and the inevitable betrayals they engender, Mr. Reed oversees a talented cast but there are questions about the emotional depths and lengths to which they go to shed light on this complex question. Jack Tynan, Alexis Boozer Sterling, James McAndrew. Photo by Ed Krieger. For those unfamiliar with the play, it opened in 1947 under the direction of Elia Kazan and won both Miller and Kazan a Tony Award. Set near the end of the summer in 1946 the action unfolds over the course of 24 hours wherein two families essentially unravel as a buried truth is unearthed. Ann Deever and her brother George Deever return to their hometown after years of absence incited by their father’s conviction as a war profiteer. Mr. Deever was Joe Keller’s business partner; he went to prison after they sold cracked cylinders to the government. Those cylinders caused the deaths of 21 pilots; and even though Joe and Kate Keller’s son Larry was a pilot now missing in action, Joe reminds everyone time and again that Larry didn’t fly the type of plane that was impacted by the faulty part. Their other son Chris Keller is a WWII veteran, just as George is, and experienced traumatic events that impact him yet he feels ready now to ask Ann to marry him and she couldn’t be happier. The trouble is, Ann was Larry’s girl and Kate is convinced this marriage would all but put Larry in the ground – a place both Chris and Ann are more than ready to consign him to. It isn’t as simple as losing a son, for Kate knows that Joe was the one responsible for the cracked cylinders finding their way into US planes – not Deever. He ordered the shipment out then called out sick with the flu to provide plausible deniability. Jessica Moreno and Alexis Boozer Sterling. 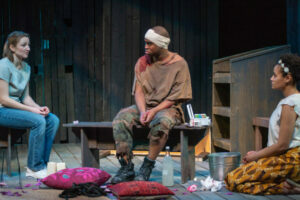 No synopsis will quite capture the level of emotion the play both inspires and demands, however as with all plays by Miller, there are explicit directions as to the level of emoting that each character is proscribed to do. 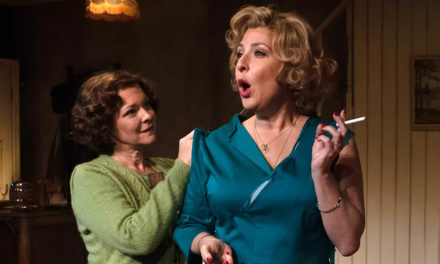 This production either allows or pushes both Kate (Francesca Casale) and Chris (Jack Tynan) to sobbing levels of near hyperventilation that essentially robs the audience of their capacity to feel for these characters. This is not only America in 1946 – this is Miller’s America in 1946 – and the men in Miller’s America aren’t allowed to break down into hysterical tears that last for minutes on end. That’s why a certain percentage of them end up shooting themselves. If they could cry and be real about their feelings, the tragedy wouldn’t land as succinctly. When the tears and moans of pain aren’t filling the air, there is a lack of tension that makes us wonder what character knows what about who. The text is laden with hints throughout but tonally and emotionally we never feel the danger. Joe Keller (Mark Belnick) has his moments of panic that come out in brief bursts of emotion but the underlying sense that Joe is all too aware of the threat George might impose is not fully realized in the performance. George Deever (James McAndrew) is delightful in the moments where he is allowed to lose himself in memories of the past; it is his anger and loss that feels the most fully realized, though that might be due to his having the clearest course of action in the play. As Ann Deaver, Alexis Boozer Sterling takes on the challenging role of the inactive listener for much of the play with grace and poise but when she tells Kate that she cannot leave alone, she must be with Chris, we wish she was allowed the room to feel that need a bit more acutely but with all that occurs in the third act perhaps her presence acts as a tonic. As Chris Keller, Jack Tynan is strongest in the first act when he is blissfully unconscious of the darkness that surrounds him – in particular, his ‘I kissed Annie!’ moment is so charming, we wish he had been forced to find the same subtlety without the tears in the third act. 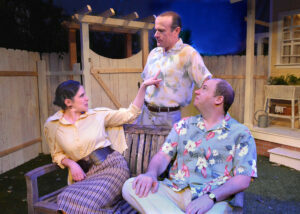 Jessica Moreno, Bill Doyle, and Michael William Thompson. Photo by Ed Krieger. Maddie McCormick and Michael William Thompson play Lydia and Frank Lubey – neighbors that seem to embody an American need to smile and be nice no matter what and their innocence contrast starkly with the Kellers and the Deevers. Young Bert is played by Beckett Wilder on the night I saw the play [by Jack Heath on other nights] and his innocent belief that Joe is a kind of neighborhood sheriff rather than a neighborhood ‘crook’ is charming. 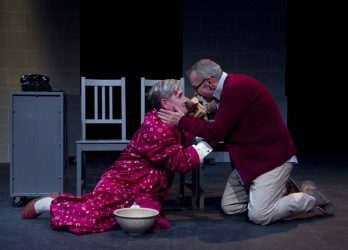 Jessica Moreno and Bill Doyle play Sue Baylis and Dr. Jim Bayliss with a certain knowing air about them that makes them two of the most delightful aspects of the production. When Dr. Bayliss talks about money, it feels like a dated argument but one that still has the power to break our hearts. 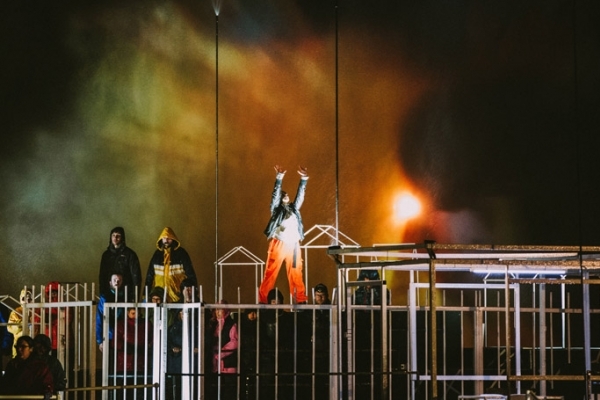 Overall, though it is challenging to emotionally connect and though there are missed opportunities to explore relationships, the play feels as though it could have been written for our present moment. When Kate speaks of Deever she touches on a vital truth in saying, “there are certain men in the world who rather see everybody hung before they’ll take the blame”. Joe has justified what he has done by stating he did it for his children. “Chris, I did it for you”, he reasons, “…it was a chance and I took it for you. I’m sixty-one years old, when would I have another chance to make something for you?” Chris embodies a noble spirit that feels lacking now when he counters with “For me! Where do you live, where have you come from? For me! – I was dying every day and you were killing my boys and you did it for me? … What the hell do you think I was thinking of, the Goddam business? Is that as far as your mind can see, the business?” Joe sacrificed his duty to his fellow countrymen in the name of the business. For money. The more things change, the more they stay the same. 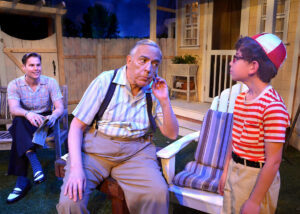 L to R: Jack Tynan, Mark Belnick, and Beckett Wilder. Photo by Ed Krieger. 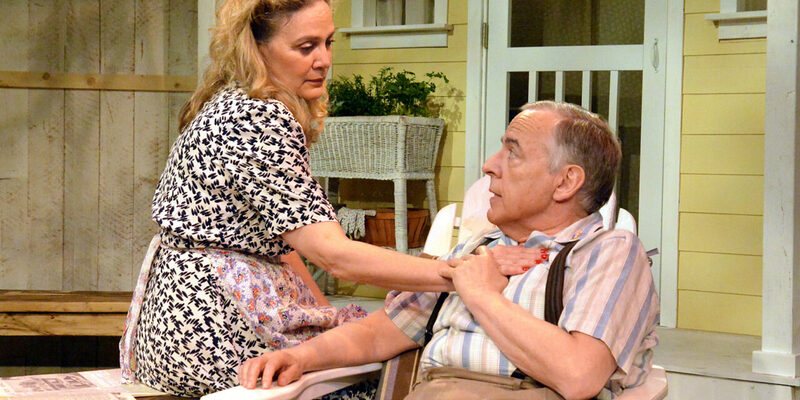 Wasatch Theatrical Ventures is a producing entity that focuses on creating “great American plays, at the highest artistic level, in the intimacy of small theatre… at affordable ticket prices.” All My Sons is produced by Racquel Lehrman, Theatre Planners. 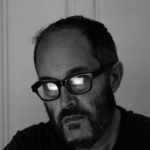 The Scenic Designer is Pete Hickok. Lighting Design by Derrick McDaniel. Sound Design by David B. Marling. Costume Design by Shon LeBlanc. Graphic Design by Kiff Scholl, AFK Design. Property Design by Bonnie Bailey-Reed. The Assistant Producer is Misha Riley, Theatre Planners. The Production Stage Manager is Jen Palumbo.